Olympus Has Fallen is an action/thriller from director Antoine Fuqua. 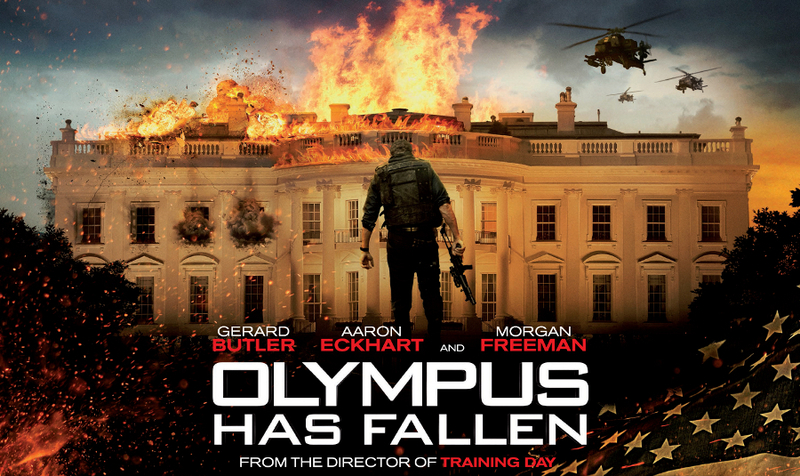 In the wake of a terrorist attack on the White House (code name: Olympus), disgraced former Presidential guard Mike Banning becomes the last hope in order to rescue the President. The movie stars Gerard Butler as Mike Banning and Aaron Eckhart as the U.S. President. A terrorist attack on the White House gives us our plot as Branning uses his previous knowledge to outsmart the terrorists and rescue the hostages. Morgan Freeman plays Speaker Trumbull who ends up as acting President (so basically the highest figure of authority as usual). It sounds very patriotic, and it kinda is. The character of Mike Branning and the plot can be compared to the likes of John McClane and Die Hard although I can’t see this one turning into a franchise. The cast were good in the film, Branning is a likeable character as are the others. The premise is very unbelievable but putting that aside the plot was decent. The action was overall good but sometimes a little unnecessary. The actual attack on the white house itself was really cool, it was clearly a well thought out attack and it plays out very well. The movie did make me question it at times. As you could probably guess the terrorists were after America’s nuclear weapons, they plotted to detonate them and only the president and two other hostages have the “codes” to activate the weapons. You’d guess people were a little nervous on the outside. What confuses me though is that the emergency council’s top priority was to ensure the president’s safety, not the U.S. population. Little spoiler here: at one point we are to believe the president is just about to be transported by helicopter by the terrorists, he knows the last code to the nuclear weapons, at that point, it crossed nobody’s mind that perhaps sacrificing the president would save its 320 million population, just saying. Little rant aside, Olympus Has Fallen was entertaining, a little cliché at times but a good action movie all round. It’s also interesting to note that a movie with a similar title and plot is out already in the states and soon in the UK called White House Down.